Americans oppose Donald Trump’s emerging tax plan by broad a 17-point margin, with 60 percent saying it favors the wealthy -– including six in 10 of the wealthy themselves. As details –- albeit still scarce -– have emerged, support and opposition have grown essentially in tandem. Fifty percent in this ABC News/Washington Post poll oppose the plan, up 6 percentage points from September; 33 percent support it, up 5 points. The rest, 17 percent, are undecided. Criticism of the plan goes hand-in-hand with negative views of Trump’s efforts to improve the federal tax system overall: 56 percent rate him negatively on this issue, versus 34 percent positively. A key criticism is the sense that the plan would mostly benefit the rich; 60 percent say so, versus 17 percent who think it will treat all people equally and 13 percent who think the middle class mainly will benefit. Even among those with incomes of $100,000 or more, 61 percent think the plan chiefly will benefit the wealthy. 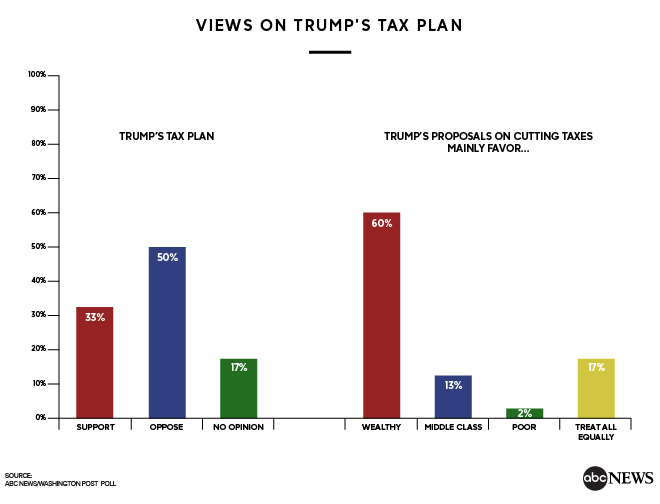 That’s a major impediment to public support: Among those who think it will chiefly benefit the rich, support for the Trump tax plan plummets to 10 percent, versus 79 percent among those who think others, or all, mainly will benefit. Details of the plan were released yesterday and responses could shift as its components become better known. The “favor the rich” criticism is comparable to that leveled at George W. Bush’s 2003 tax plan, which passed nonetheless on nearly a party-line vote; anywhere from 56 to 61 percent in ABC/Post polls at the time thought it favored the rich. That said, as many as 26 percent thought the Bush cuts were equitable across groups, 9 points higher than now. Support for the Trump plan peaks at 75 percent among Republicans and those who approve of his job performance overall in this poll, produced for ABC by Langer Research Associates. Opposition hits 79 percent among Democrats and 78 percent among Trump disapprovers; it’s 52 percent among independents, with 29 percent in support. Largely explaining these stark differences, 65 percent of Republicans and 56 percent of conservatives think the plan would treat all people equally. A mere 9 percent of Democrats and 10 percent of liberals agree. Among other groups, opposition peaks at 66 percent among nonwhites, 64 percent among young adults and urban residents and 60 percent among those with advanced degrees and Northeasterners. Support, while lower, peaks at 43 percent among those living in rural areas and about four in 10 older Americans, whites, middle and higher income-earners, and men. This ABC News/Washington Post poll was conducted by landline and cellular telephone Oct. 29-Nov. 1, 2017, in English and Spanish, among a random national sample of 1,005 adults. Results have a margin of sampling error of 3.5 points, including the design effect. Partisan divisions are 31-23-38 percent, Democrats-Republicans-independents.